Nothing is impossible! TENGGER CAVALRY teach the greatness of every sound symbiosis: With a mighty mix out of Mongolian overtone singing and violin empowered folk metal these New York mind blasters create something special and unique. And here it is: TENGGER CAVALRY's sixth record and Napalm Records' debut titled Cian Bi, set to be released on February 23rd 2018! Cian Bi stands for the name of an ancient nomadic tribe that immigrated into Northern China to merge cultural differences. The band's nomadic fighting spirit helps to fuse unworldly cultures in harmony - and that's the spirit! With their music as a deputy: Distorted guitars and doublebass-blast beats hit this very own singing style out of Central Asia. With the Mongolian horsehead fiddle aka Morin khuur these extremes got stick together to a thrilling sound you have never heard before. This is innovation surpreme! 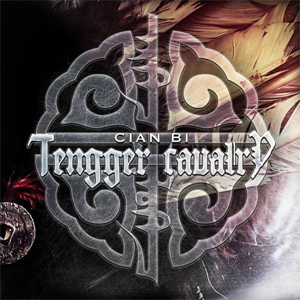 Now TENGGER CAVALRY unveiled their stunning album artwork and the track list of Cian Bi. "In this album, we used the concept of the Cian Bi tribe, to express the idea of multi-culture development, acceptance of diversity and individual freedom. We believe that through individual choice and identity freedom, each of us can decide who we want to become and embrace every culture around the world as one nomadic tribe - human tribe." "Ride Into Grave And Glory (War Horse II)"
"A Drop Of The Blood, A Leap Of The Faith"
"One Tribe, Beyond Any Nation"
"You and I, Under The Same Sky"
Coming as CD and Digital Download, Cian Bi is now available for pre-order HERE.